I’m always impressed when one of our Inspired Hygiene clients steps outside of their comfort zone and does something extraordinary. This is definitely the case with Dr. Richard Tomlinson of Tahoe City, California and his daughter Lindsey Combe, RDH. Lindsey and Dr. Tomlinson left the US on December 28, 2014 and didn’t return until January10, 2015. They traveled together to Cambodia to take part in a medical/dental mission. 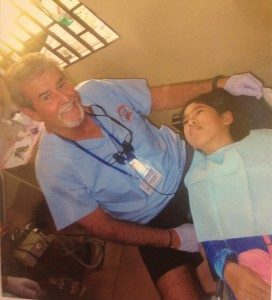 After practicing for over 38 years and serving patients from the North Shore of Lake Tahoe, Incline Village, Truckee and beyond, Dr. Tomlinson told me this was something he and his daughter had always wanted to do and now, he can check it off his bucket list. You’ll also be interested to see how their IH journey has elevated their patient care over the last year as reflected in their statistics. I know their story will inspire you and you’ll enjoy the photos. Scroll down and read on! 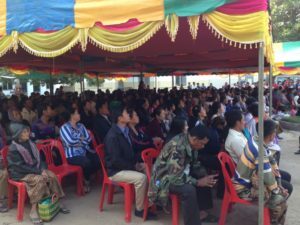 Lindsey was one of two Hygienists and Dr. Tomlinson was one of five dentists who traveled abroad to bless the people of Cambodia with free dental care. The majority of the over 100 volunteers were from California, but some came from as far away as Boston and Florida and also included physicians, nurses, pharmacists, and lay people. “The clinic time was emotionally and physically exhausting. The patients that we worked with were the poorest people from the most rural areas of Cambodia. The level of physical suffering was beyond what I could have imagined. We simply don’t know how good we have it here in the US. We set up at a local “hospital” which looked like animal stables and the whole group was able to see about 800 patients every day. The mission services included: nursing, pharmacy, vision, ER, pediatrics, internal medicine and dental stations. The dental clinic saw the “healthier” population and I’m sure not one patient we had in the chair had ever seen a dentist or a toothbrush. I was not “cleaning” many teeth. Instead, I was administering anesthetic, performing simple extractions, assisting dentists with more complicated extractions, taking x-rays and sterilizing instruments. I was also administering fluoride and working on basic oral health education. I had to teach other volunteers how to teach brushing techniques because I had so much to do in the clinic I had to outsource the patient education. After working with the Cambodian people so intimately, I now feel a very intense connection with them and their culture. I hope to be able to return to Cambodia on another missions trip. 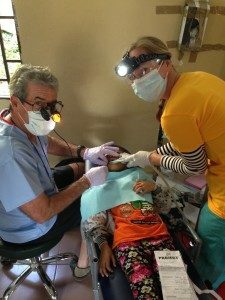 In addition to helping needy patients in Cambodia, Dr. Tomlinson and his team are providing excellent care for the population of Tahoe City and beyond. Take a look at the chart below which details how far they’ve come and how many periodontal patients are receiving life saving periodontal care. Great job Dr. Tomlinson and team! My hat’s off to all of you! We have all worked in private practice where the morning huddle can vary on so many levels (if there even is one)! Often it can become a wasted 15 minutes of time discussing what everyone did the night before or waiting for half the staff to show up! FRUSTRATING to most and very ineffective to say the least! 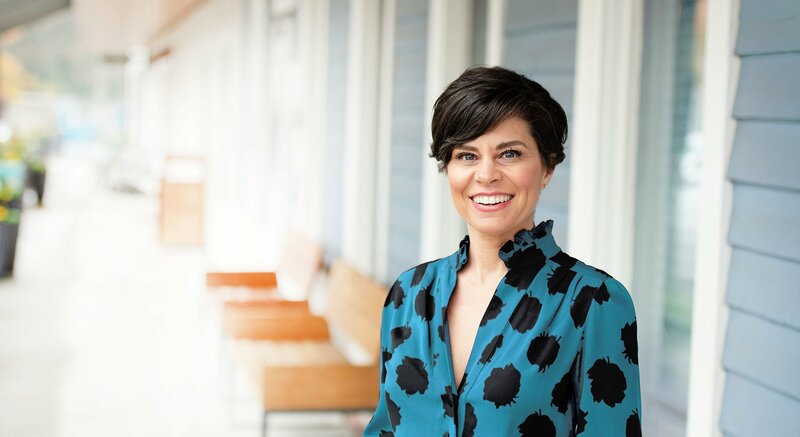 Watch the short video below that walks you through a morning huddle work sheet (download worksheet) that I personally use when working private practice. The work sheet should be filled out by each team member and then reported quickly at the huddle and used as a point of personal reference throughout the day. If you would like more tips and information from Inspired Hygiene coaches, you can check out our Facebook page. We welcome questions and healthy discussions. I’ve been in Dentistry my entire adult life and I can honestly say I’ve never met a dental professional that would knowingly violate OSHA safety and infection control procedures. On the other hand, I have observed many questionable practices when it comes to sterilization and infection control. In those cases, I suggest a trained OSHA Safety Officer evaluate their protocols. I was in Tulsa, Oklahoma, March 29, 2013, the day the story broke about W. Scott Harrington, DDS, the oral surgeon who exposed more than 7000 patients to HIV, hepatitis C and hepatitis B. As I understand it, he had entrusted responsibility of infection control and sterilization to his team. None-the-less, he was responsible. Are your infection control protocols up to date? When was the last time you reviewed protocols as a team and tuned up your efforts? Well here’s your chance!! Join Pat Pine, RDH and I for ‘Stealth Safety – Staying safe in today’s busy dental practice’, a webinar for our Mastermind clients, on February 19 at 1pm EST. Let us help you ensure that what’s going on behind the scenes in your practice is 100% compliant with today’s ever-changing regulations. Do your sterilization and infection control procedures meet OSHA & CDC’s current standards? Join us for this informative webinar and take the mystery out of the equation. Patricia M. Pine, RDH is a national and international speaker on dental professionals health and safety. Pat has designed her OSHA training boot camp to provide medical and dental offices with a fun way to stay up-to-date with OSHA and infection control requirements. Her career has been multifaceted including, clinical dental hygiene, dental hygiene education, writing and speaking. To learn more about Pat visit www.uniquedentalservices.com. This call will be available in our Mastermind Library on February 19. If you’re not already a member of our Mastermind group, Click here to sign up. As the new-year unfolds, I’m excited about the months of ‘glorious time’ ahead to accomplish my 2015 goals! Because I know you’re the kind of person who starts the new-year by setting your intention to accomplish your goals too, I wanted to share some powerful information with you. According to dictionary.com, power is the ability to do or act, the capability of doing or accomplishing something. Sounds good, right? To learn more about how you can put the ‘power of yet’ to work for you this year, read this weeks attached article, The Power of Yet. Here’s to your ongoing success, this year, and beyond! A few years ago my husband introduce me to TED Talks and I’ve become a huge fan. In fact, rather than watching conventional television, we will often surf TedTalk for something interesting to watch. It’s easy to find a 10-20 minute presentation on just about any subject that might interest you. Always informative and interesting, the talks are often very entertaining as well. One of my current favorites is ‘The Power of Yet’ by Carol Dweck. Picture this: you’re at your monthly team meeting reviewing performance statistics with your team members. The practice has fallen short of several benchmarks. We can’t ignore these shortfalls and of course we need to discuss them and brainstorm, as a team, how we can ‘improve’ moving forward. 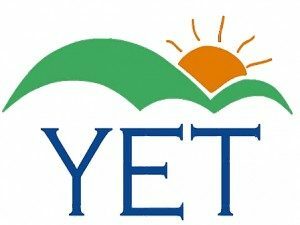 Enter Carol Dweck and ‘The Power of Yet’! With this slight shift in thinking, we can now view our shortfalls as simply not getting there yet! This changes the entire focus of the thought process, the inevitable negative emotion, and the conversation, to that of hope, encouragement and teamwork. ‘Yet’ implies that this is a goal we can reach and opens the door for team collaboration and brainstorming. Set aside a few minutes today, or during your next team meeting, to watch Carol Dweck and The Power of Yet on ted.com/talks. An investment of about 20 minutes could make the difference in reaching your 2015 professional and personal goals. Regardless of your role in the dental practice, you can improve the positive focus of your team by bringing the power of yet to your next team meeting. Goethe said, “Be bold, and mighty forces will come to your aid.” Don’t put this on the back burner. Do it today! Take the initiative; you’ll be glad you did!